LOS ANGELES, Calif. /California Newswire/ — Starlight Children's Foundation's Winter Wonderland – a day when more than 350 Starlight kids, siblings and their parents are given the opportunity to experience the holidays by decorating cookies, making ornaments, meeting Hollywood celebrities, and more – will be held on Dec. 8 at 10 a.m. at CBS Studios. The current "X Factor" soundstage is being turned into a children's wonderland courtesy of Northwestern Mutual. "We're so grateful that, through our partnership with Starlight Children's Foundation, Northwestern Mutual can support programs such as Winter Wonderland that deliver entertaining activities to families to uplift their spirits in the most challenging of times," said Matt Plocher, managing partner at Northwestern Mutual-Los Angeles. "Our goal is to help strengthen families who are fighting cancer by ensuring that joy and happiness are enduring parts their lives. I am looking forward to seeing those smiles and visiting with families at Winter Wonderland this weekend." This year, 20 Northwestern Mutual financial representatives will be volunteering at the event to directly touch the lives of these families. It's all part of the financial security company's Childhood Cancer Program, a multi-year commitment to accelerate a cure for childhood cancer and to support families battling the disease. Employees from Michaels will volunteer to help kids and parents decorate cookies, make ornaments, decorate frames, create greeting cards and more. Starlight kids will be delighted by a special visit from Santa and Mrs. Claus and a massive toy give-away, including coveted items like Guitar Heroes. Performances and attendance by StarPower Ambassadors, including Zachary Gordon star of "Diary of a Wimpy Kid" and Sierra McCormick who plays Olive Doyle in the Disney Channel Original Series "A.N.T. Farm," make the afternoon truly unforgettable. Winter Wonderland, one of Starlight's signature Great Escapes, will give families with a seriously ill child the chance to spend time together outside of the hospital, escape their medical worries and return home with a renewed sense of strength, hope and community. In addition, more than half of these children attending are fight childhood cancer. "This event puts smiles on so many faces and allows us to escape our everyday reality which is much needed from time to time," says Starlight mom Miriam whose son Adriel has Leukemia and will be attending the Winter Wonderland along with his siblings. "There is a strong connection between emotional and physical health. Great Escapes are one way that Starlight works to improve the life and health of seriously ill children," says Jacqueline Hart-Ibrahim Global CEO of Starlight Children's Foundation. "We are so thankful to Northwestern Mutual for their support of Winter Wonderland and other Great Escapes that benefit our Starlight families." When a child is diagnosed with a serious illness, the day-to-day joys of childhood take a back seat to the rigors of treatment and hospitalization. Since 1983, Starlight Children's Foundation(tm) has been improving the quality of life for children with serious medical conditions through programming that helps kids cope with the experiences of prolonged illness and invests in the emotional well-being of the entire family. Starlight is the only global children's charity partnering with every major pediatric hospital in the U.S., U.K., Canada, Australia, and Israel and serves more than 4.5 million children every year. 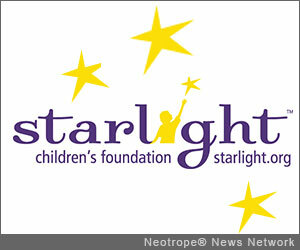 To learn more about Starlight visit http://www.starlight.org/ . The mission of the Northwestern Mutual Foundation – the largest corporate foundation in the state of Wisconsin – is to build strong, vibrant communities that serve as a legacy to future generations. The Foundation's giving is designed to create an impact on the communities where the company's employees and financial representatives live and work. In fiscal year 2013, the Foundation will contribute $16.9 million to nonprofit organizations across the country. The Northwestern Mutual Life Insurance Company – Milwaukee, Wisc. (Northwestern Mutual) – among the "World's Most Admired" life insurance companies in 2012 according to FORTUNE(R) magazine – has helped clients achieve financial security for more than 155 years. As a mutual company with $1.3 trillion of life insurance protection in force, Northwestern Mutual has no shareholders. The company focuses solely and directly on its clients and seeks to deliver consistent and dependable value to them over time. Northwestern Mutual and its subsidiaries offer a holistic approach to financial security solutions including: life insurance, long-term care insurance, disability insurance, annuities, investment products, and advisory products and services. Subsidiaries include Northwestern Mutual Investment Services, LLC, broker-dealer, registered investment adviser, member FINRA and SIPC; the Northwestern Mutual Wealth Management Company, limited purpose federal savings bank; and Northwestern Long Term Care Insurance Company; and Russell Investments.